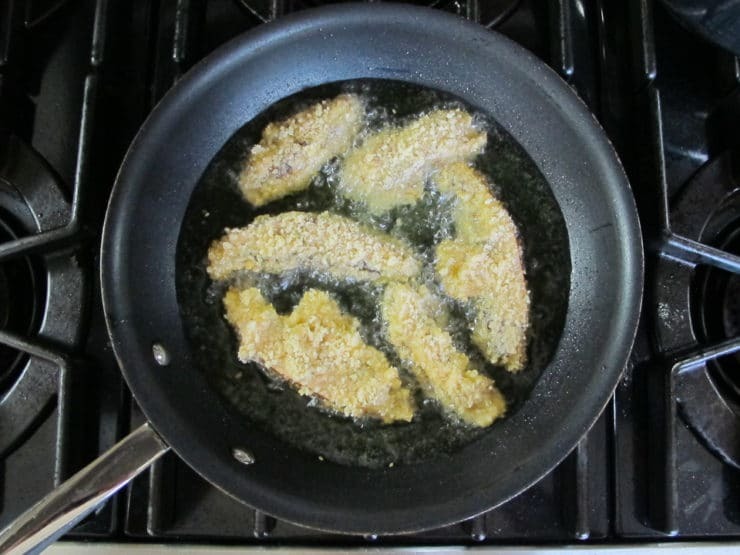 Beer-Battered Schnitzel Recipe with Panko. Irresistible! A few years ago, after lots of trial and error, I developed a truly amazing batter coating for fried foods. I was tired of making batters that didn’t stick, soaked up too much oil and didn’t have a really great crunch to them. I combined a tempura-style batter, enhanced with spices for extra flavor, with panko breadcrumbs (and optional sesame seeds) to create the ultimate crispy/crunchy coating. 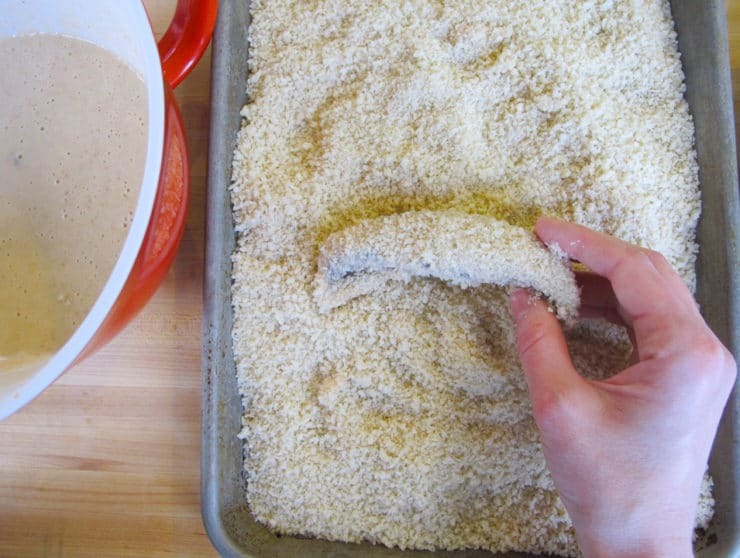 Over time friends, family and even blog readers started calling it Tori’s Crispy Panko Coating. I’ll take full ownership here, as it took me many experiments and lots of messy dishes to get it exactly right! You may have seen it before on my Crispy Panko Fish Tacos recipe (minus the hot sauce). Here I’ve combined my “famous” coating with Portobello mushrooms to create an entirely new, incredibly addictive vegan entree. Schnitzel, which is typically made with pounded meat that has been breaded or fried, is a traditional Austrian dish made with veal (known as Wiener Schnitzel) or pork. Chicken schnitzel is a favorite dinner in our household, but lately I’ve found myself experimenting with vegetarian alternatives to the dishes we eat on a regular basis. Replacing the chicken with sliced Portobello mushrooms seemed like a tasty meatless alternative. 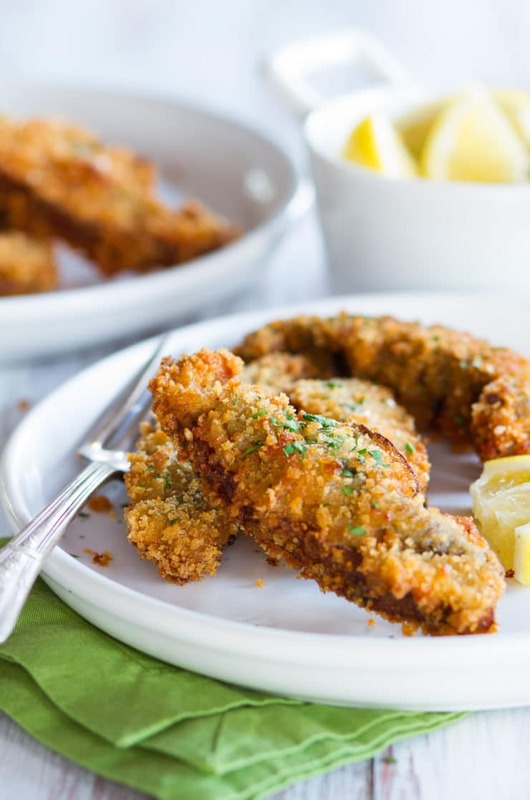 I took this concept a step further and replaced the usual egg-and-breadcrumb coating with my “famous” Crunchy Panko Coating for an ultra-crispy, incredibly delicious and fully vegan entree. Portobellos hold up well when battered and fried; they have a remarkably meaty taste thanks to the exposed gills beneath their cap, which allows for air to flow through and evaporate any excess moisture. 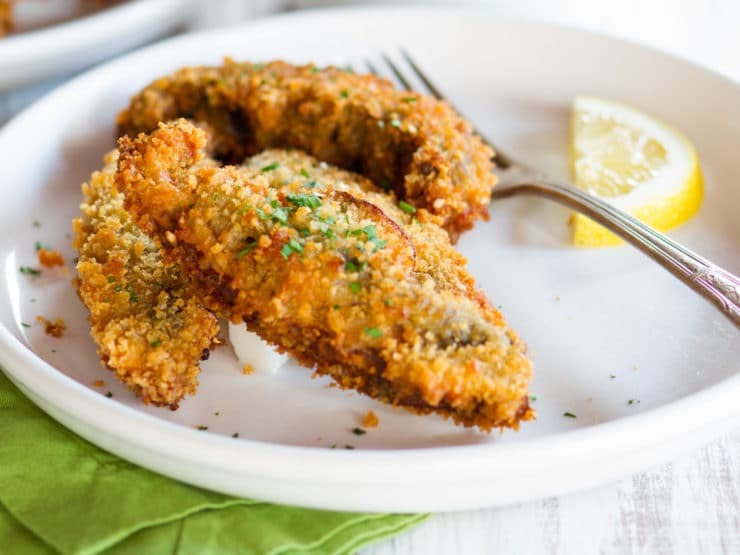 The resulting Portobello Mushroom Schnitzel is addictive and can be served as an entree or appetizer. I think they’re good with just a squeeze of fresh lemon juice, but feel free to serve them with your favorite dipping sauces. I’ve pasted a few ideas below. They’re remarkably budget-friendly too– four portobello caps can be stretched into six full entree servings. I’ve been saving this one for a special occasion, but I can’t keep it a secret anymore. It’s just too good. Every time I cook it for guests I get requests for the recipe. I figured it’s probably time to get it up on the site, that way I won’t need to keep printing it out for friends. This is going to become one of your new favorite meatless dishes, promise! Delicious crunchy vegan beer-battered schnitzel recipe with panko. Can also be made with seltzer instead of beer. Crispy, flavorful, irresistible. 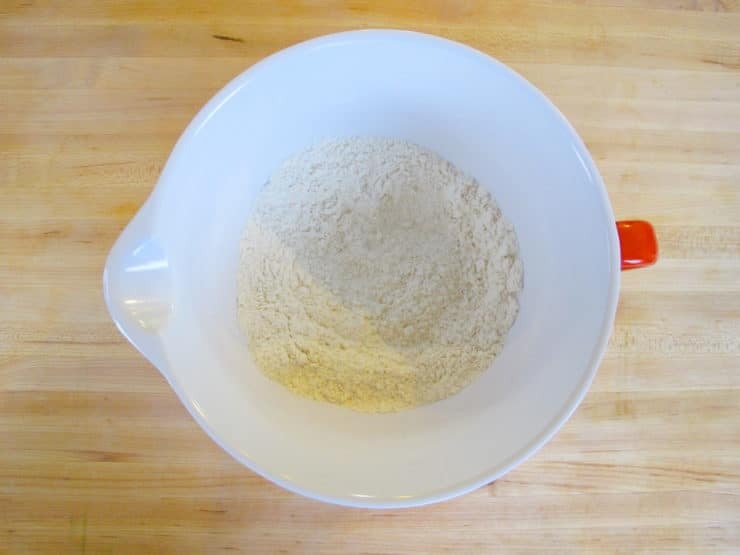 In a mixing bowl whisk together the flour, cornstarch, salt, garlic powder and cayenne. Stir in the hot sauce and beer or seltzer until a thick but pourable batter forms. Note that the beer will be difficult to measure out due to foam; you’ll need at least one 12 oz. bottle of beer to make this batter. 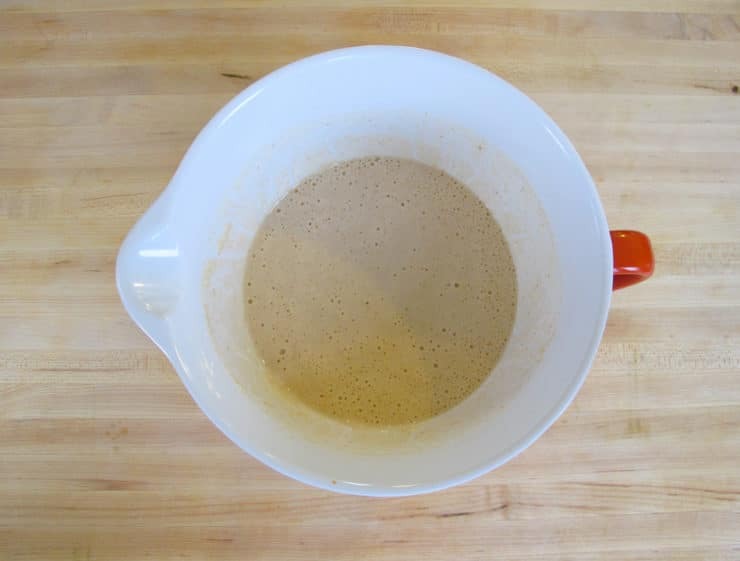 The batter should be thick like pancake batter, but if it appears clumpy or overly thick add more beer, seltzer or water until mixture is thin enough for dipping. ...then into the panko sesame mixture to coat. Use one hand for wet dipping and the other for dry, otherwise you’ll end up with lots of clumps in the dry coating ingredients. 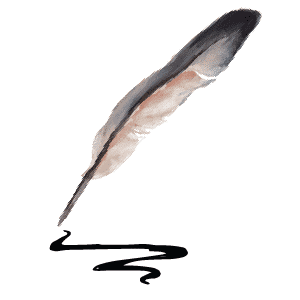 Heat ½ inch of grapeseed oil in a skillet over medium until hot but not smoking. Fry the mushroom slices in batches of 4 or 5 pieces for 2-3 minutes on each side until golden brown and crispy. You may need to add more oil midway through cooking. Drain on paper towels or a wire cooling rack. Sprinkle with additional salt to taste, if desired. Serve hot. Life changing. I just made these in my air-fryer. Amazing!!! I now need to run to the store as we are having a Superbowl Party tomorrow and I need to serve these. Thanks for this recipe, I can see a variety of things that could use this breading. PHENOMENAL not only in taste and CRUNCH but also in how the coating clings and fries up perfectly. I used my T-Fal fryer and set the temperature to the recommended setting. And I also added chicken tenders to the mix-same batter but sprinkled a bit of smoked paprika and other seasoning AKA the Chicken bites recipe Tori has posted elsewhere. Have you ever tried to bake these? No, I recommend frying but if you have special dietary concerns you can try baking, it might turn out well. My family absolutely loved these mushrooms. Only my daughter is vegan so I crumbed the mushroom snitzel first, then I crumbed thinly sliced chicken breast snitzels and cooked them in different pans. As I did not have any cayenne pepper, I used some morrocan spice in its place. In place of the hot sauce I used some extraordinarily hot Japanese red chilli paste. I also added Nutritional yeast flakes to the Panko and sesame crumb mix. They were very yummy!!! My daughter said they were like something you could order in a really nice vegan restaurant. I think the mushrooms were far tastier than the chicken, but both were really lovely done with the batter and crumb mix. Thank you so much for the idea! This is absolutely killer. One of the best recipes ever. Dangerously good. I didn’t change a thing, except added a squeeze of lemon and a chipotle mayo sauce for dipping. Schnitzel was originally from Italy, it was not called schnitzel of course. It was called colleta, something. I always thought it was from Austria, or perhaps Germany as well. But watching a Rick Steins program where he traveled to Austria the woman from some restaurant told the story from which it originated. I’ve cooked this twice and it’s been a hit both times! Incredibly tasty, and surprisingly straightforward to make. Thanks so much for the recipe! This recipe was fantastic, I loved it and will have it again and again! Hi Ann, Tori’s assistant Ashley here. I wouldn’t recommend that for this particular recipe. Going to try it in my air fryer. Spray it with a little oil before placing it in the air fryer. Did it work? Was thinking the same thing? Can I use sliced flat mushrooms for this? Or will they fall apart? Thanks. Hi Michelle, Tori’s assistant Ashley here. I’m not quite sure what you mean. For this recipe we sliced the portobellos, not the whole cap. 2nd time making these tonight and I’m so hooked! Thanks for the great recipe!! Can you bake these and get a similar result as I don’t like to fry my food? Hi Pam, Tori’s assistant Ashley here. Unfortunately I would not suggest baking these, you won’t get the same crispy coating. I have baked this recipe a few times – the only thing I did was added an additional 2 minutes bake time to get a someone crispy coating. Tastes great! Do I have to use cornstarch? Hi Kathleen, Tori’s assistant Ashley here! The cornstarch is an important part of creating the crispy light and airy texture. I would not recommend leaving it out. Okay, I am so hooked on this recipe. Fried bellos?! SUCH A GOOD IDEA! I featured this recipe in my recent post. Thank you! We made these using button mushrooms last night and they were fantastic. “Best mushrooms. Ever!” said DH. That said, we did make some modifications. We used a GF flour mix from Pamela’s (cup for cup), as we find the blend of rices and starches make for a lighter, tastier coating. The genius part is the panko dredge at the end. Will use this technique for other vegetables and meats (chicken tenders come to mind). The oil has to be hot enough to make for a crispy, non-greasy coating. We found that our oil needed to be around 370F to achieve this. We used our deep fryer, a DeLonghi roto fryer that uses less oil. However, the same results can be achieved using a deeper vessel, like a 3 or 5 qt Dutch oven, and a candy thermometer. Don’t recommend using a nonstick frypan for this recipe, as nonstick is not recommended for high heat cooking. Have made these at least 4 times. Insane recipe! Yay! 😀 So glad you like them. I’m really proud of this one. I’ve made these and they are amazing! These are great, Tori. I tried making some today and loved the crunchy coating! Fantastic! I made these tonight and didn’t tweet recipe a bit – they were delicious! My family loved this recipe so much they begged for it 2 nights in a row! I didn’t even change anything the 2nd time around. Yummy! Perfect. O. M. G!!! This recipe is simply amazing! I made it the other day and will make it again tonite. Was wondering if you’ve ever fried pickles using this same recipe? Anyways thank you so much for sharing this…it is SO SO delish!! Okay, I’m very sick from eating this. Don’t allow yourself to get really hungry and then try these or you will be sorry. I made regular schnitzel for 3 family members and this schnitzel for myself and my son who is vegetarian. Both of us loved it but I was so hungry, I kept eating it so now not feeling so well. I dipped it in honey mustard. Highly recommended. I wonder how it would taste baked? If anyone tries to bake instead, please post. I couldn’t really even tell it was portobello mushroom. Very, very good. Great for vegans and vegetarians!! Tasty and crispy…added a pinch of za’atar. Also used basics of this recipe with chicken breast strips for non-vegan company,, added crushed garlic and butter with which I marinated chicken, then into batter and sesame mixture and fried to golden. Placed on pie pan in 200 degree oven to keep warm while other pieces cooked. Served with brown rice and steamed baby bok choy, garnish of pickled ginger. Yum, yum!! I just made these and they were awesome. I used whole wheat pastry flour, and I substituted the cornstarch for 2.5 tablespoons of arrowroot. I also used seltzer instead of beer. I skipped the hot sauce, and in hindghsight I realize the only thing that I think my taste buds would have appreciated would’ve been a slight kick in flavor. But that,was my fault. As others have said, the breading was amazing. You’d never know it didn’t have eggs or milk. Thanks for sharing. 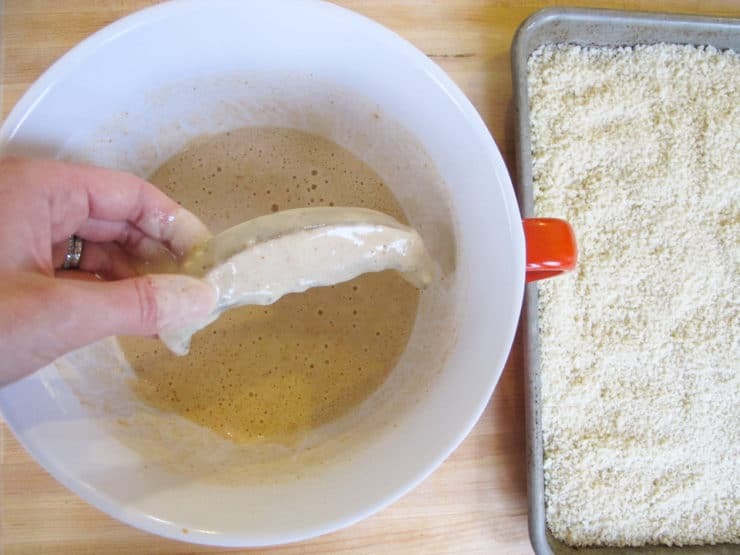 I used this breading for chicken strips tonight and it was perfect! As I didn’t have any panko bread crumbs on hand, I used ran some old matzoh and croutons through the food processor. They worked wonderfully. In the past, I have always botched any attempt at doing breading, but this was absolutely delicious! Thank you so much!!! At some point, I’ll try it with the mushrooms, especially since we have a few vegetarian (and a few mushroom-loving non-vegetarian) friends who would love them! What a wonderful idea! Putting it on my list for dinner next week–thanks! Would another oil work, like coconut oil? Do you think this could be baked instead of fried? Michael, I don’t think this particular batter technique will be very good if it is baked. I could be wrong, I haven’t tried it. Do you think this can be made gluten free? Maybe almond flour or rice flour? Thank you very much. Ailuy I’m not sure, I’ve never tried it with those subs. If you try it please let us know how it works for you. I used a gluten free all purpose flour tonight with mine and it turned out ridiculously delicious and crispy! Also used gluten free matzo because I ran out of panko. Wish I had thought to add a side of sauerkraut. I’m an absolute freak for mushrooms, so this was a no-brainer for me. I made them for dinner last night and they were phenomenal! This isn’t only a keeper, it went to the front of my recipe file. Fantastic with the Yemenite schug! Thanks Torey! Would love to try this with chicken. Could it be baked instead of fried? I love schnitzel. I had it in Switzerland. I can’t wait to try this! prepared the right way nice big portobello mushrooms could be very good. I just made these tonight for dinner! They were really good. I also add o used carrots as well. One note this batter is thick that it used a lot of panko bread crumbs and when I thinned the batter out it didn’t stick well. Gonna gonna gonna do it ! Oh, Mama .Mia looks good! Yummy. Going to try it. With a fried egg for dinner. Perfect…. sounds similar to a local brewery’s portobello “fish” and chips. They have a great crunchy tempura batter. This sounds lovey. And I’m an omnivore. Another yummy triumph for your cookbook. Thanks for posting..
Would almond flour work in place of regular flour for this?